Home › Recipes › Homemade Oreos — Super Easy! Homemade Oreos — Super Easy! Cake mix cookies seem to be the rage lately. So guess what? These home-made Oreos are also cake mix cookies! I am typically a “from-scratch” kind of mom. But, that is about to change. Enter the easiest, lowest-fuss-of-all homemade Oreo. What is your LEAST favorite part of baking or cooking? If you’re like me, it’s the clean-up. I hate the feeling of creating something wonderfully yummy and then looking at a floury kitchen that has to be wiped and swept down. Whoever decided to start making cookies from cake mixes must have felt this way too, because with cake mix cookies there is minimal mess — I mean minimal! I have been baking more cookies in the past six months of my life than ever before, and I am being completely honest when I say this has been my favorite cookie recipe to make — ever. I loved how perfectly pretty these turned out and how quickly I got them from mixing bowl to oven. It’s OK with me that I have to admit theses aren’t completely from scratch. The time-saved is definitely the deciding factor for me. I think it’s ingrained in all of us moms to have home-made cookies for our kids. It makes us fell all warm and fuzzy inside to see our kids eating cookies we made, instead of those hard, crunchy cookies from the junk food aisle at the grocery store. These cookies will get the cookie-baking done and leave you time to play with your munchkins and spruce up the house. Turning these fabulous oreos into sandwiches really takes them up a notch in the cookie-baking world. It puts you in the magnificent, super-mom category! 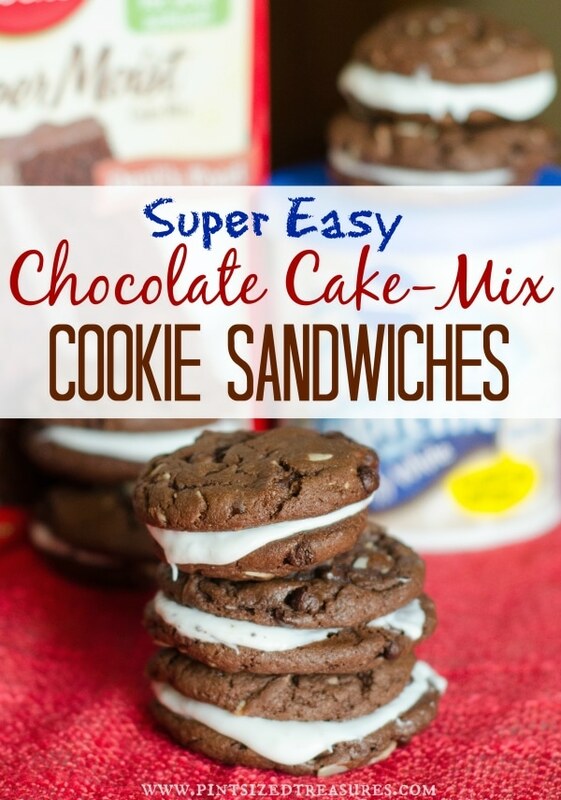 Your kids will be amazed that TWO cookies can be turned into ONE sandwich. If they calculate their numbers correctly, they will realize this is a win-win situation. When you tell them they can have one cookie before dinner, they actually get TWO! Yay for mom! Just taking that extra simple step to create sandwiches also makes these homemade oreos a perfect party dessert. You can make the cookies smaller and bake about five minutes shorter to create two-bite, mini cookie sandwiches. I highly recommend keeping them refrigerated so they will keep a cute shape and not become too gooey for guests. If you’re serving them to your own munchkins, they’ll like the gooiness. Trust me on this one! Alright, let’s get some no-fuss, easy baking going on! Ready, get set — preheat! Preheat oven to 350 degrees Fahrenheit. Now, mix cake mix, eggs and oil until thoroughly incorporated. Next, stir in chocolate chips and almonds. Line three cookie sheets with parchment paper. Now, roll teaspoonfuls of cookie dough into balls. For mini cookies, roll 1/2 teaspoon for one cookie. Bake for 8-10 minutes. If making mini cookies, bake for 5-8 minutes. Remove cookies from oven and let cool. Once cooled, spread on one teaspoon of frosting onto one cookie and place another cookie on top to create a sandwich. Gently twist the top cookie until it sticks to the frosting. Serve immediately or refrigerate until ready to serve. Enjoy! Yields: 36 cookies.